There could be several reasons to use VPN apps. VPN apps allow you to bypass country restrictions, be anonymous and avoid any kind of tracking. It also makes sure that you are not exposed while using a public Wi-Fi network. So, it is basically for those who care for their privacy while browsing the web. VPNs are also available or Android devices. These apps let you configure the device to connect to VPN server and make sure your internet communication is encrypted and potentially protected from stalkers. How to choose the best VPN for Android? There are lots of VPN apps available for Android devices. All these apps offer similar kinds of features but for different prices. Costlier is not always the better. There are lots of things you need to take care while selecting a VPN to use. The good VPN must encrypt your connection and doesn’t keep logs. It must also offer good speed and good up time. As it routes traffic from an encrypted server, the speed will be down from the speed you get while regular Internet usage. But the speed must not be too down to give you struggling experience. Here are the best VPN apps you can use on your Android devices. 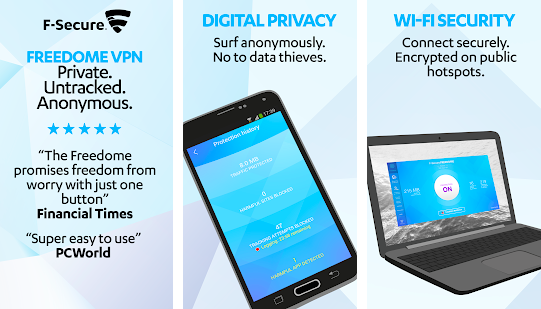 VyprVPN is a fast and reliable VPN service to offer you privacy and security. It just keeps logs of IP addresses, connection times, and bytes used for 30 days. And this data is also not shared by any third-party companies. It offers over 700+ servers spread across 70+ locations around the globe and supports 256-bit encryption. 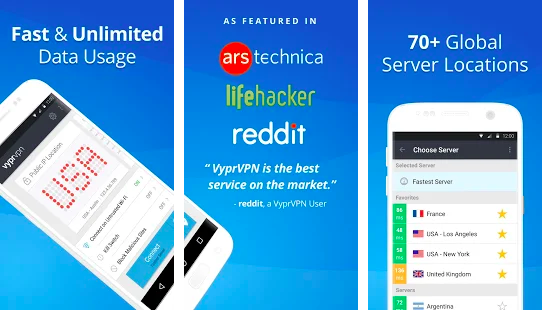 The app of this VPN is easy to use. There is no data limit. So, you can enjoy browsing without any worry. The standard account costs $10 per month with an option to pay $60 for a year. In the basic account, it allows three simultaneous connections. There is also a better plan with better features. They also offer 24x7x365 support. 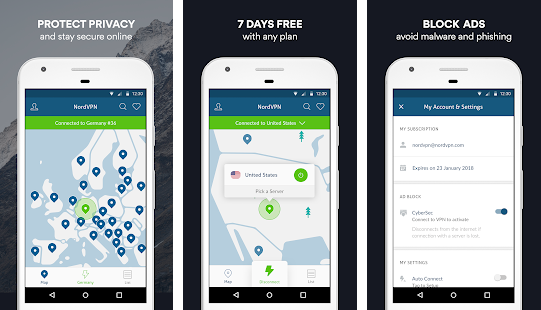 NordVPN is also a recommended VPN app for Android. 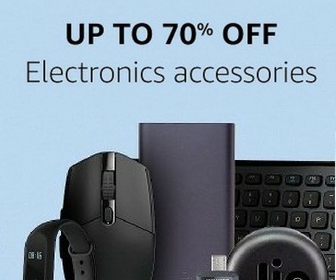 It offers easy to use UI and decent speed at reasonable price. They own more than 400+ servers spread across 59 countries to make sure you are connected. It ha no logging policy and claims military-grade encryption. The company is located in Panama, so it is away from U.S. or European monitoring. It helps you in unblocking geo-restricted websites and stream your videos. It hides your IP address and encrypts your internet traffic on public networks. You are allowed to use 6 VPN connections under 1 account at the same time. The service costs $12 per month but you can get a discount if you pay for a year or.2 in advance. You can claim 7 days free trial if you want. ExpressVPN is also a good choice for VPN. It also offers good service and great customer support. It supports 256-bit encryption to keep your connection safe. It doesn’t log traffic or browsing activity. It claims to offers 145+ connection locations in 94 countries. Even if the numbers of not much, but you still get reliable connection. You always switch your location as many time as you want. It works fine with all mobile data carriers and Wifi. You get 7 days free trial and after that, you have the option to pay $13 per month, $60 for six months, or $100 for a year. 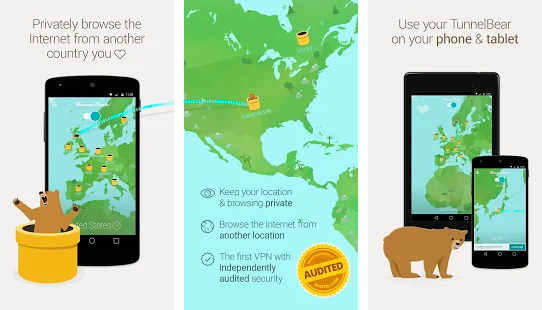 TunnelBear VPN is a simple bear-themed package VPN app. It claims minimal logging and promises not to track you ever. It does not log your IP and never share any data with third-party services. It also supports 256-bit encryption and has servers in 20 countries. It offers decent speed and is the really cute app to use. You can see server locations on the map. You get 500MB of free data every month for a single device. That is not sufficient, so you need to subscribe that costs $10 per month or $60 for the year. In this plan, you get unlimited data for up to 5 devices at the same time. This VPN app is from Finnish provider F-Secure. It claims to over 20 countries and claims not to log your data. The app is easy to use and offers decent service. You can change the location anytime you want. It is worth to note that it does not allow BitTorrent use in many countries, including the United States and the United Kingdom. You get 5 days of free trial and then you can buy it at $50 per year for three devices, $60 for five devices, or $80 for seven devices. Not just these, CyberGhost, PureVPN, HideMyAss are also few good VPN services you can try. You can download any of these VPN services and start browsing the web anonymously. 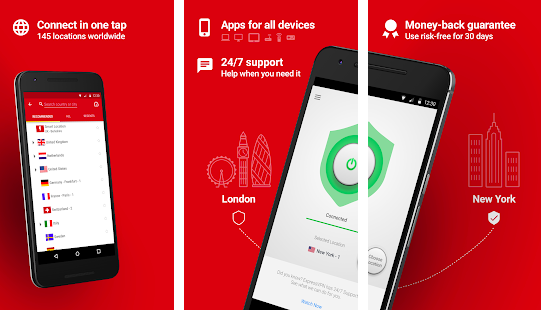 Opera VPN was also a good free option but the company has decided to shut down services. So, you have these paid options. I also recommend going with paid services as free services are always risky and they log data.